Toyota stands for reliability, which has been tested time and again for decades. One may have never heard of a Toyota breaking down. When it comes to it nothing can be more reliable than a Toyota car with you behind the wheels. 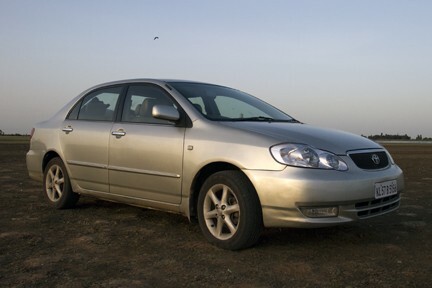 The Toyota Corolla has been a best seller across the world and a second hand Toyota Corolla is a good buy in India too. Being a true Toyota car that it is, it’s no wonder that it still sells in good numbers. Due to this fact it may be difficult to find a used Toyota Corolla. A good, if not the best, place to start looking for this car would be the certified used car multi-brand dealerships. The 1.8- liter 125 BHP variable valve timing engine is a good reliable partner that does not call for a lot of attention and so is the transmission. For first timers, Toyota recalled a batch of cars because the top-end version of the car was ill-fitted with leather door pads which did not suit the climatic condition in India. They later armed the car with a pink hue after breaking their heads in their conference rooms. So, one must watch out for this change. The Toyota Corolla has a known rear brake problem, albeit a minor one. On releasing the hand brakes a typical sound is heard, the very moment when the pad releases the discs. This has been sorted out a long time back, but it would be worth the effort to check the car you are mulling to buy for the same problem. To suit the Indian terrain, the suspension of the cars were raised, but this led to incorrect alignment of the wheels, which in this case wears out unevenly. After a mileage of about 25,000 km the suspension in the front loosens up and makes a squeaking noise especially over bad roads and bumps. One must appreciate the fact that this is a minor problem which can always be rectified with replacing of bushes and a tightening job. Juddering of the clutch commences once the Corolla has clocked about 15,000 km. adjusting it correctly is a difficult task and the probabilities of this problem persisting on those cars are high who have overshot that mileage. Wearing is very rapid on the brake pads hence they require attention due to this tendency. So while testing a used Toyota Corolla you are mulling to buy, check if the brakes emit noise and if they are rough or spongy. Needless to say the risk of damage to the disc is grave with the use of worn out disc-pads. The cooling fan had this notorious tendency to blow out the fuses, due to its lower rating, it was later rectified by the company, so check out if the said rectification is carried out. One must not forget the cardinal rule of staying away from cars which have undergone accidental repairs. So check out for those, also the sealant lines on the tower mounts and the front apron. Check them thoroughly to your satisfaction. Keep an arms length distance from cars which gives a shred of a doubt of being a case of accident-repair. Check the rooflines for any kinks or folds; this will be visible only when you take a couple of steps back from the car and look at the roofline. If there are kinks in the metal it is a clear indication that the car has been repaired for accident. Fixing of bumpers and broken headlights can be a bit expensive. The rear and front bumper cost approximately Rs 5,288 and Rs 4,300 and each headlamp will pinch you a further Rs 4,608. The fuel pump that costs a whopping Rs 10,000 is another costly affair to do with. Do check for this or you may regret later while paying through your nose. While driving the used Toyota Corolla, inspect if the throttle response is linear and smooth. Body corrosion has never been an issue with the Corolla, as it has been comparatively built far too tougher than the other mid-sized cars of its class. If you are not the driving types and like to be lost in your thoughts at the back seat of your car, the Toyota Corolla is the ultimate car. The rear seats of a second hand Toyota Corolla are luxurious, roomy and made of high quality materials. No prizes for guessing this one- it’s the best in its class. The light clutch, light steering and good ergonomics makes even the ride in the city a delight for the driver. The top-end version of the Toyota Corolla comes with electronic climate control and six-CD changer, if you could stretch the budget, the icing on the cake couldn’t be more delicious. The price of used Toyota Corolla from the 2006 batch would be Rs 6.78 lakhs whereas a more recent one would go for Rs 8.98 lakhs. With all said and done, you absolutely make an impeccable choice with a good pre-used Toyota Corolla.